Economic Freedom Fighter president Julius Malema may face charges of assault and damage to property. The firebrand politician is being investigated for his role in a road rage incident in his home town of Polokwane, Limpopo. Economic Freedom Fighter president Julius Malema - and three accomplices - faced charges of assault and damage to property but they've since been dropped. The firebrand politician was investigated for his role in a road rage incident in his home town of Polokwane, Limpopo yesterday. “A case of common assault and damage to property has been opened by a motorist, who said Malema and three men assaulted him in a street in Polokwane on Tuesday night,” said police spokesman Brigadier Hangwani Mulaudzi. The complainant, identified in newspaper reports as Bernard Redelinghuys (22), alleged that he was cornered by a Mercedes Benz that drove closely next to him. Redelinghuys apparently hooted at the driver of the Mercedes to indicate to him that he was too close, but the Mercedes remained close, only to abruptly stop in front of him. Redelinghuys was allegedly manhandled and verbally abused before Malema got out of the Mercedes Benz and joined the three men. “Malema allegedly slapped the 22-year-old and hit his car, it is not clear what object Malema used to hit the car. The four men then got into their vehicle and drove away,” Mulaudzi said. 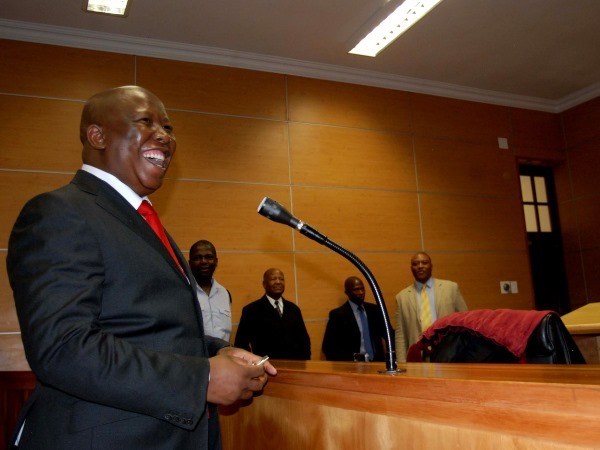 On 10 February, Malema was provisionally sequestrated by the North Gauteng High Court in Pretoria due to his outstanding debts of R16 million to the South African Revenue Services (Sars). Malema failed to submit tax returns between 2006 and 2010.